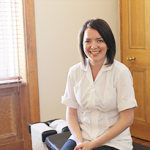 Jenny is a Glasgow lass at heart and she joined the clinic in August 2010. After completing an honours degree in anatomy at Dundee University Jenny moved to the University of Glamorgan in Wales to study chiropractic for 4 years, graduating with Merit. Jenny has since furthered her professional development by completing training in different areas including treatment of pregnant patients and prenatal yoga. She loves the holistic, natural and drug-free approach of chiropractic, helping individuals to improve their health and quality of life. In her spare time Jenny enjoys running, yoga, long walks and spending time with family and friends. As a student she spent a lot of her free time backpacking around Asia, however these days she is delighted to be back in bonny Scotland. Once a Glasgow lass always a Glasgow lass! * We are Doctors of Chiropractic not Medical Doctors. We therefore take a holistic approach and do not use drugs or surgery in our treatments.